Hi guys ! If this is your first time to read this page, it's actually all about the country that I live in, the gorgeous Malaysia, and probably some cool places that you guys should check out. To start the topic, I had a dear friend visiting my hometown, Johor Bahru. 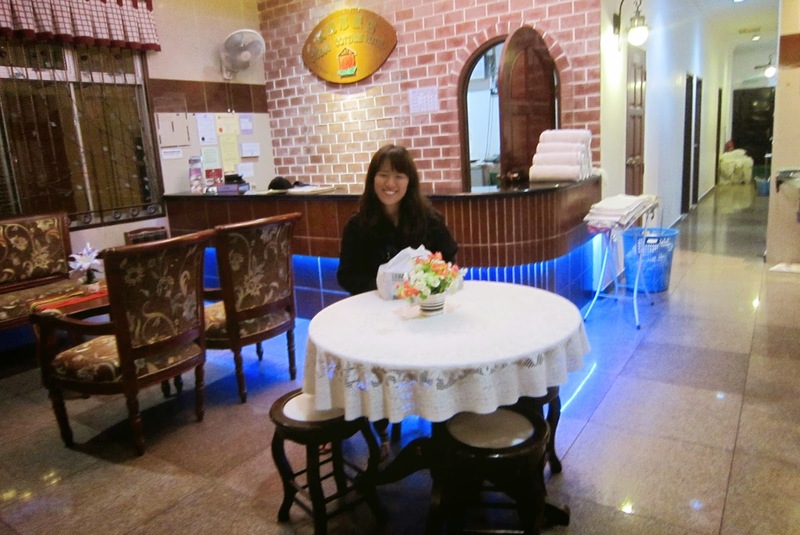 Short intro, she's actually my 'best-est' friend that I met when I was in Beijing. Back then, I talked a lot about my hometown. Like seriously, I don't think I had ever missed to mention anything around here. Let's just call her Hannah, the sweetest Korean-Canadian girl that I've ever met. She arrived at KLIA 2 on December 27 and stayed here for about 3 days. I know, that was super short ! But we couldn't do much thing about it, as she had to head back to Taiwan for her study. So, 3 days and 2 night, what could we do in that brief period ? Dozens of stuff, of course. First of all, let's talk about the meals ~~. 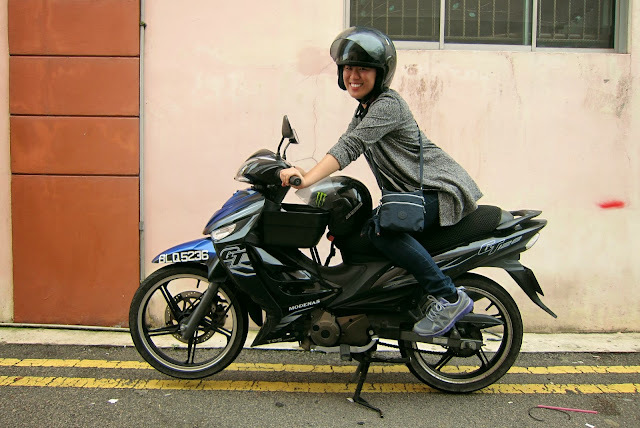 We couldn't possibly taste everything everything that Malaysia could offer, instead we'd decided to try only the Malay cuisine for these 3 days. 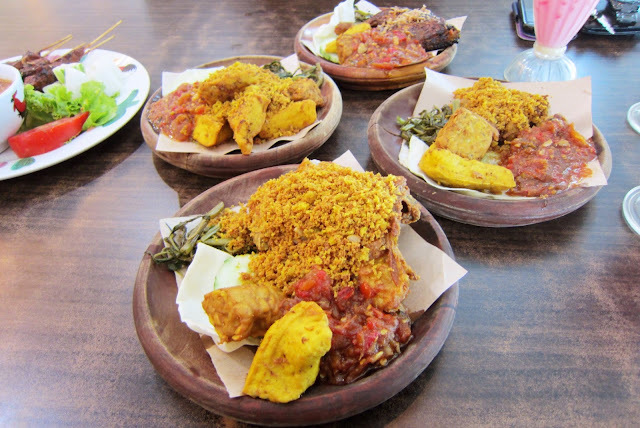 If you can see the picture below, those are the Ayam Penyet, Indonesian-Malaysian fried chicken served with white rice. Well, if you think that fried chickens are nothing, then you should try this one. They didn't just create this menu out of nothing. Plenty of spices were marinated in the chickens and mostly they used turmeric, which triggered the fragrance so well. The second picture, those are the mix pickles. 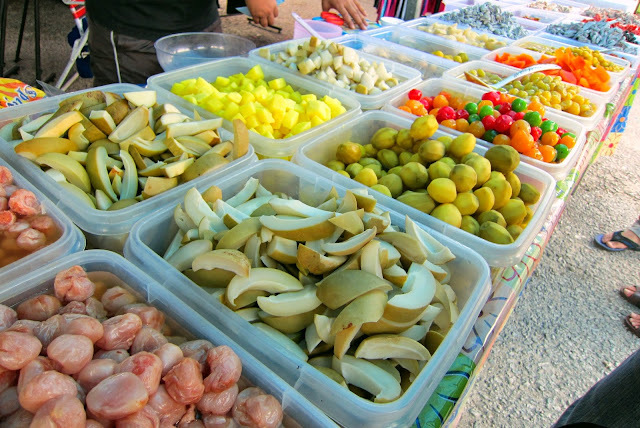 Well, when you search for pickles in Malaysia, usually you wouldn't see any cucumbers in it. Most of the time we would use ambarella, manggo, snke fruit, tropical cherry, papaya etc. They're pretty interesting to try, colorful and so much attractiveness. Hannah didn't like it though, she said it was too sour. Secondly, is the places that we went. Well, if there any of you wondering what's up with my the motorbike ? Yeah, that's mine. We used that piece of metal to travel around city. Pretty cool wasn't it ? It looks like someone had so much fun in the picture. One of the great places that we went, was Tanjung Piai ( Cape Piai ), the southern-most tip of mainland Eurasia, kind of like Cape da Roca or Cape Chelyuskin. Tanjung Piai offers a perfect environment for visitors who look for tropical rain forest. The structure of this cape can be described with 3 different phase. Most of the terrains in southern Johor state are flat, we don;t have cliffs or hills near the sea. Few kilometers before we reached the tip, we had to go through the first phase, which was the forest that filled with palm trees, banana and sugar cane plantations. But there's nothing to be worried about, because there were small towns in every few kilometers. 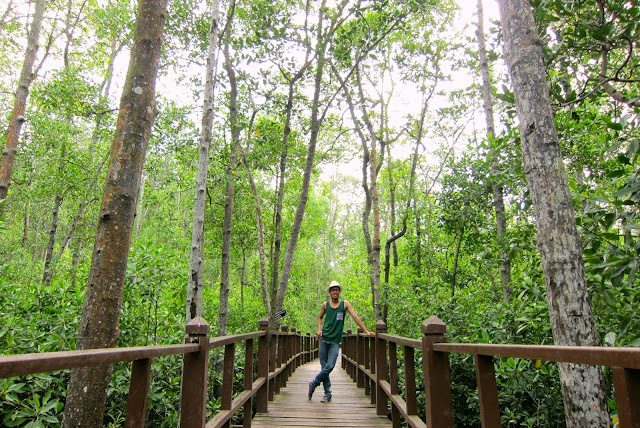 When we were there at the Taman Negara Tanjung Piai ( Cape Piai National Park ), we had to walk through the mangrove forest. You know what ? It was an awesome view of nature. The panorama of it, breathtaking. Along the bridge, people there actually placed a signboard that said "You'll never walk alone". We were pretty shocked at the sight of it, not sure if that was a threat or what. As we strolled pass the walk-path, a creature jumped across our sight. What was that ? It was monkey. Grey-haired and big eyes, we couldn't tell what kind of breed was it, but we were sure it wasn't baboon or orang-utan. There were families of it hoping around the branches as we went pass underneath them, it felt as if we were in the zoo, accept that there was no cage or fence to keep us apart from these adorable animals. Then it hit us in thought that the sign that we saw earlier, it wasn't a threat, it was actually a hint of what we could see next. That was pretty smart. 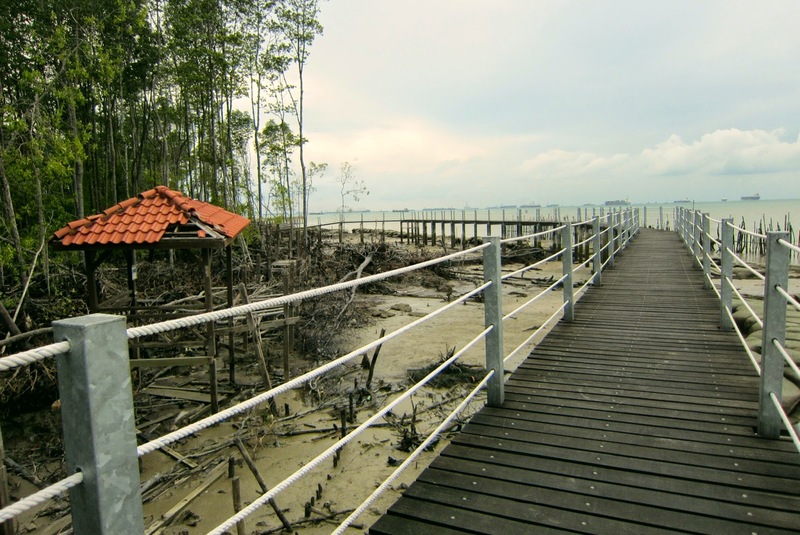 The final phase, was the end of the mangrove forest. The bridge led us directly to the jetty, where we could witness the open sea while standing on it. The view was tremendous, we could see Tanjung Puteri Port and Singapore at the corner of it. If there anyone who's planning to visit the southern state of Malaysia, this location is a must. It's like a whole various of excitement, wrapped in one pack. You will learn what tropical country really is. Lastly but not the least, the surroundings. As a visitor, I'm pretty sure Hannah was fascinated by everything around her. It didn't have to be some major stuff, everything could be fascinating. The first photo was taken at Larking Bus Terminal. 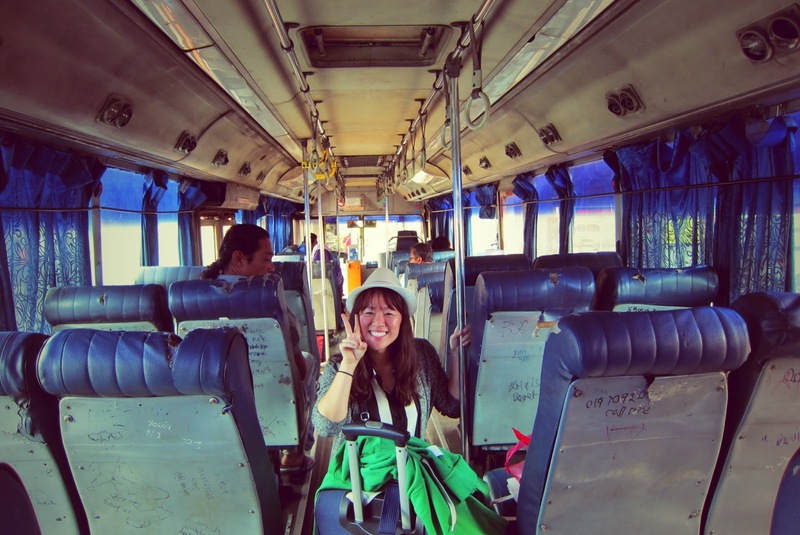 We took the express bus in between Kuala Lumpur and Johor Bahru. After getting off from the express bus, we had to take another public bus to the hotel. Lucky for us, we had the chance to board an old bus. Just look at her, so much happiness. She said it was pretty interesting to see how the locals live their life. The bus itself, said a lot on how our daily activities look like. One of the topic that we talked most, was the sky. 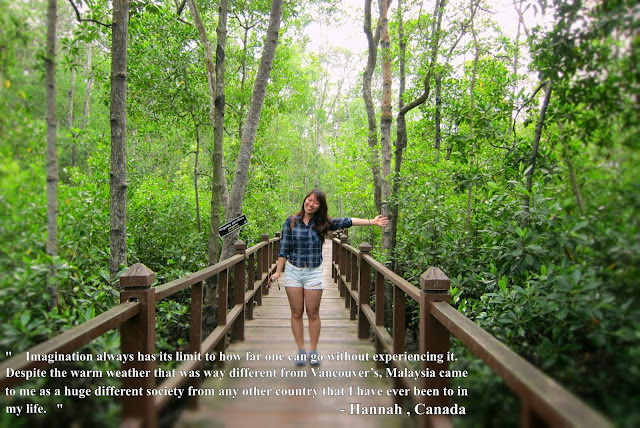 Hannah lives in Vancouver City of Canada. As many people know, Vancouver is located right next to the sea. 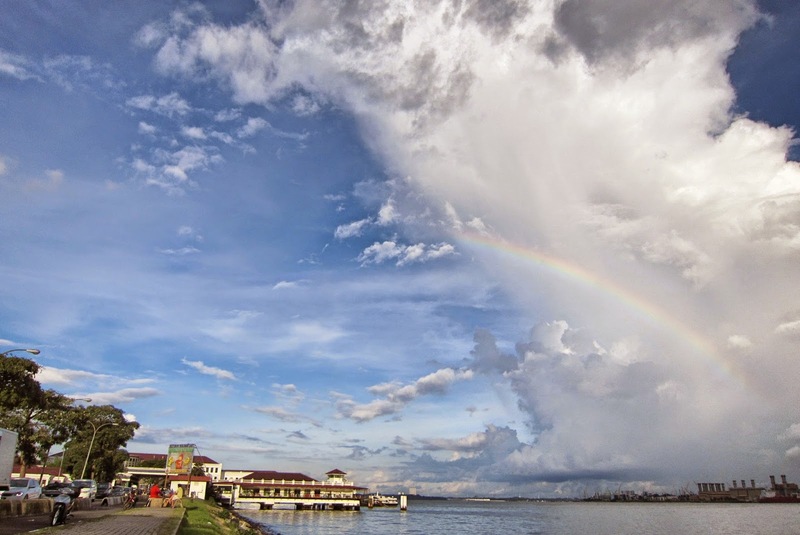 In spite of the common thing both cities have, the clouds in Johor Bahru look way more than Vancouver's. This happens due to the high temperature at noon, around 32 degrees, and the water from the sea evaporates. It then becomes like a steam and form a super thick cloud. Unlike the normal clouds that we see high above the sky, these noon clouds are pretty low, as if there are two layers of sky and it seems like you can touch it by standing on the roof top. I can't possibly wrap up all the good stuff about my hometown in one single post. Just keep in mind that Johor Bahry is not a city filled with crowds. It's a great place if you are looking for a city-escape. Beside, it's pretty cheap to stay in hotel around here. 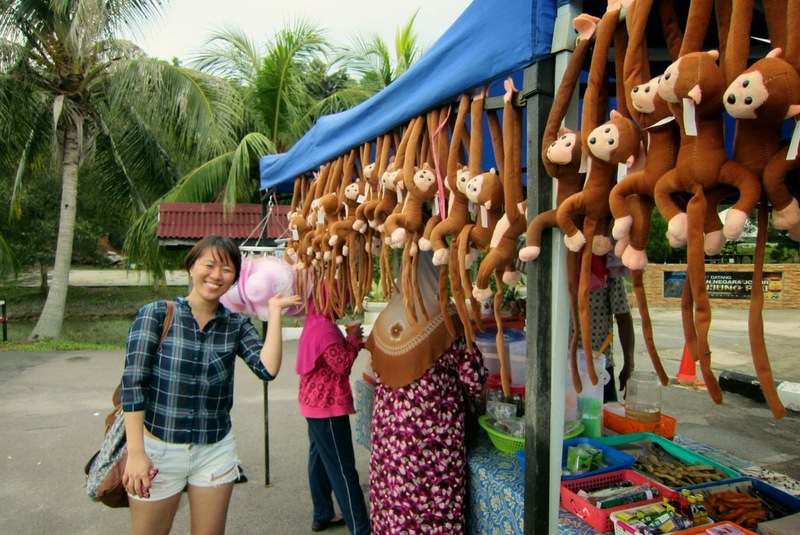 My friend got herself a budget hotel with only RM 79 for a night. It's called Rose Cottage Hotel, in Taman Perling. Wish you guys a fun trip, if you are planning to go somewhere after this. A travel quote to share : "All journeys have secret destinations of which the traveler is unaware - Martin Buber". Have fun and I hope you could find the secret destinations.